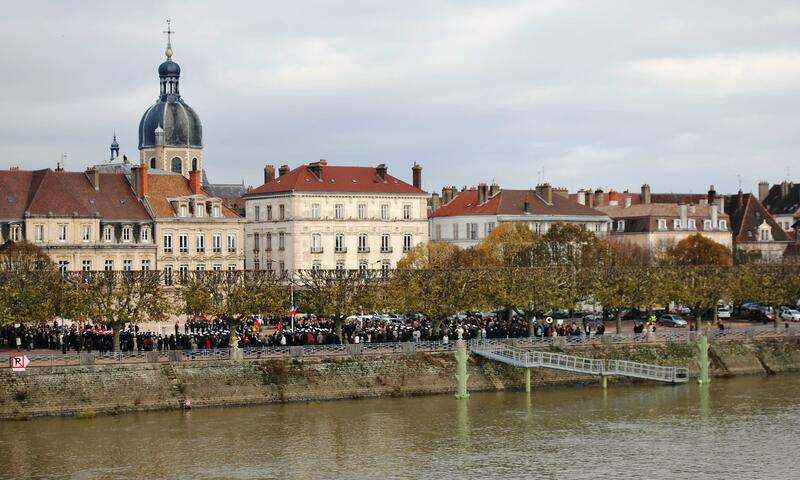 ← River Saone in Flood- Water rises two meters! We knew it was a bank holiday but did not know why. We were on the boat, when at about 10.30am, I heard the sound of a marching band. I looked up and I could see people with flags marching along the Quay wall in the town. I decided I wanted to go and have a look. I guessed they were heading towards a big war memorial on the Northern quayside. I hopped on the Strida bike and was at the memorial in less than 10 minutes, as the Marina is close to the centre of town. Nuala followed later as she firstly had to go and cancel her planned morning coffee with Dorothee from a boat called “Jameson”. When I got to the memorial, a public ceremony was in full swing. There were veterans carrying regimental flags, Army and Naval personnel on parade, an army band playing and representatives of the fire service, police and local politicians. There were also local school children who later sang the National Anthem. It was very well organised with a good public address system, a master of ceremonies who introduced each speaker and a well thought out programme. We listened to the speeches and then I realised that it must be a National remembrance day for the World Wars. The ceremony ended with a presentation of medals to some of the attending Military and Naval people, the laying of wreaths in front of the memorial and the veterans taking the salute from the military personnel. When we got back to the boat, I looked up Wikipedia to see why it was an National holiday and found the following “While Remembrance Day ( 11th November) was originally started in Britain to celebrate the end of the First World War , it was adopted as an official National holiday in France and Belgium. It commemorates the armistice signed between the Allies and Germany at Compiègne, France, for the cessation of hostilities on the Western Front, which took effect at 11:00 am—the “eleventh hour of the eleventh day of the eleventh month.” (Hence why our ceremony started at 11 am). 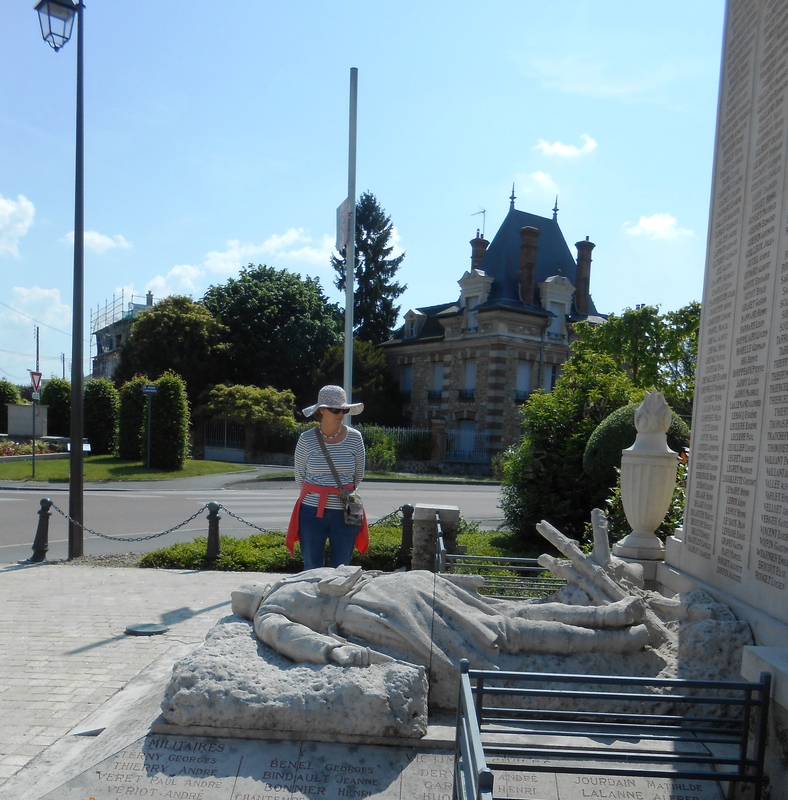 We ourselves had visited the site of the signing of the armistice in a railway carriage in a forest glade in Compiègne and I have commented in many blogs of the fact that every French town or hamlet seems to have a First World War memorial inscribed with long lists of dead or injured local people. (Incidentally in the Second World War, Hitler for revenge insisted that the French unconditionally surrender in the same railway carriage at the same place. He then had the carriage taken to Berlin where it was put on public display). 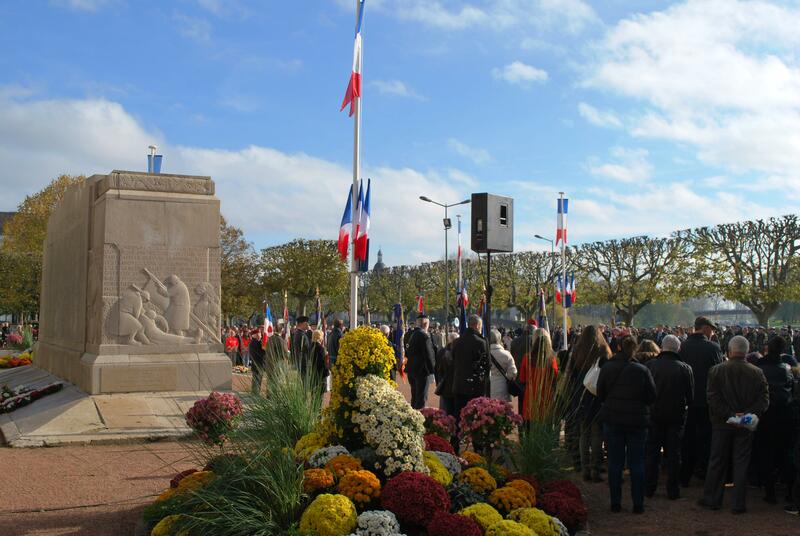 For such a sunny warm day on a National Holiday, we were surprised at the small number of people who came to watch the ceremony so obviously the remembrance of the war in France is fading, which is understandable as it is now thankfully 96 years ago. 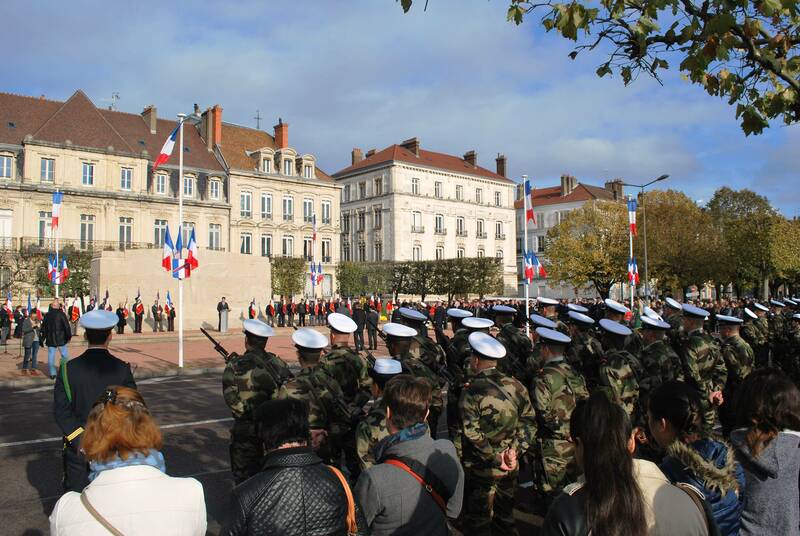 We however felt privileged that we were in France on the day to experience the ceremony for ourselves. This entry was posted in On the Journey, Places visited, Reflections on Life, World War 1 and tagged 11th November, Armistice Day, bleuet de france, blue cornflower, chateau thierry, Compiegne, end of world war 1, France, Great Patriotic War, poppy flower. Bookmark the permalink.